The strength of the Shelter Rite structures was put to the test in 2012, when they withstood all of the fury of Hurricane Sandy. On the New Jersey side of the Hudson River, there lies a park built in 1985 to honor the memory of someone devoted to preserving nature. 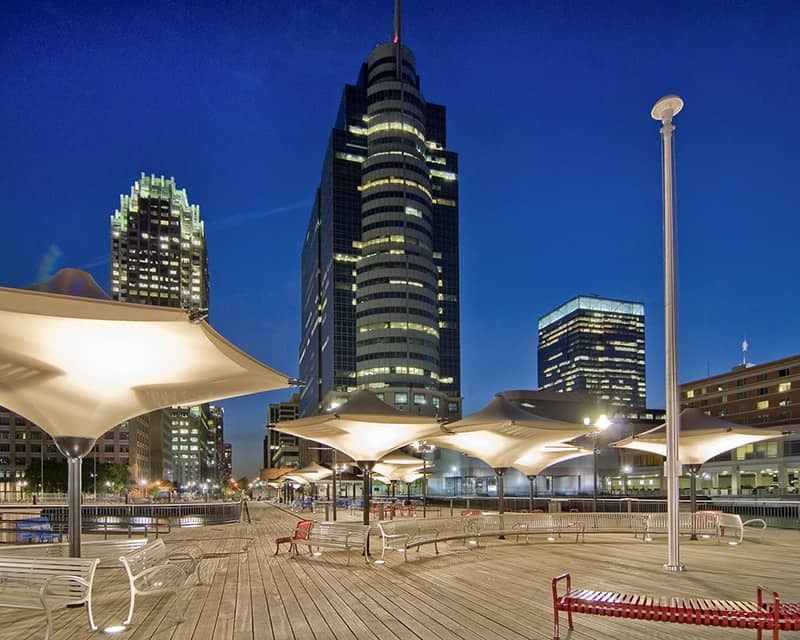 After 23 years, Jersey City chose to further invest in the park with a renovation, including a redesigned seawall and promenade including new lighting and seating. The new design included a unique array of tension membrane structures, which serve as shade elements in the day and light sources at night. These iconic shades are constructed from Shelter Rite® Brite™ Architectural Fabric, utilizing a fluoropolymer film top finish over a translucent coated fabric. Shelter Rite Brite was selected for its tensile strength and long term aesthetics. The rugged strength of the reinforcing fabric allows heavy ice or snow loads to be easily carried by the structure. Shelter Rite tensile strengths exceed 200 lbs/in, allowing sufficient tension in the finished structures for the curved features. The attractiveness of the design is more pronounced by the tan color of Shelter Rite Brite. The structures themselves, trade-named Flexshades® by Tension Span Structures, a division of Vesl Group, were specifically designed to give a modernistic touch and new life to an important, scenic and historical site. The Flexshade structures utilize tensioned Shelter-Rite fabrics to create a stable, permanent umbrella. Its unique appearance is derived from a 3-dimensional tensioning with resulting curvatures. The strength of the Shelter Rite structures was put to the test in 2012, when they withstood all of the fury of Hurricane Sandy with no damage whatsoever, despite maximum exposure to the wind and tidal surge along the Hudson River. Shelter Rite also contains a UV stable, dirt-resistant fluoropolymer film top finish allowing for superior cleanability from the extreme weather. From the view of those beneath the structure, the slight translucency of the fabric as well as the fluoropolymer top finish on the Architectural Fabric enhances appearance and longevity. Tension Span Structures (part of the Vesl Group), a 30-year designer and fabricator of Shelter Rite architectural fabric structures, developed a customized Flexshade with Reicon Group, LLC. Reicon, the project design/constructor, is a heavy marine contractor. Reicon selected the Flexshade concept utilizing the Shelter Rite Brite for its unique design, attractive fabric features, and long track record of the architectural fabric itself. As previously mentioned, this park was constructed in Jersey City, New Jersey, and dedicated by the city to the memory of Mr. Grundy. When Mr. Grundy was actively promoting environmental and preservation issues in his hometown of Jersey City, New Jersey, he gave great weight to parks and other features which touted the scenic Jersey side of the Hudson River. A location was selected that allows residents and visitors to enjoy the amazing views of the Hudson River and the Manhattan skyline, while serving as a venue for festivals, concerts and other cultural events, including the summertime Jazz for Lunch Concert Series. By day and by night, visitors to the J. Owen Grundy Park now have yet another reason to spend time in this historic and scenic location, thanks to the addition of Shelter Rite Brite Architectural Fabrics.